When it comes to arranging furniture in a room, most people will come up with one or two ideas about how they want the furniture placed. Sometimes with a little extra thought, and some imagination a person can come up with a few extra furniture arranging options for the space. This post was an exercise for me, and I came up with Twelve Different Ways of placing furniture in the same room. I used the information I presented in my Sept 7th post titled Arranging Living Room furniture, so sofas talk to chairs, like the pros do to make the different groupings in the spaces. I hope after looking at what I have come up with, it will inspire you when it comes to placing furniture in your own home. The Room that I have chosen has windows on both the far end walls (front and back). Two entries bring you into the space, they are both on the left. The room has a long wall on the right side that you see when you enter it that has no architectural details, or there is a fireplace on either the left or right side of the room. Placing Furniture ..When it comes to placing furniture in a room, it is easiest to do if your room has a focal point like a fireplace. The fireplace would be your starting point and all your furniture would be grouped around it. If your room had no focal point to build upon, First stand in the entry way to your room. From that spot, look across the room for the longest wall, that will probably be the best wall to locate your sofa and start making your furniture arrangement around it. If you have an open concept house, with few long walls, look for the longest windowed wall in the room and back your sofa against it, and arrange your furniture out from there. I think it looks warm and inviting, when you first enter a room, if you see something soft and comfortable looking like a sofa or grouping of cozy chairs in front of a fireplace. It invites you to come in and relax. I know in these modern times, everyone is into entertainment centers, flat screen TVs, etc. When looking at all the room illustrations I have come up with, just imagine your entertainment center in the space where I have placed a fireplace in the rooms. If your room has no architectural / built-in focal point, your entertainment center, large flat screen TV, etc is your focal point, and you will be building your room around that. Interior Decorating is all about Equal Balance. In the living rooms shown in the illustrations, the sofa and chair combinations are counterbalancing the focal point, which is the fireplace. If you are introducing an entertainment center, large flat screen TV, etc into the space, you are counterbalancing that/those product(s) with furniture as you did with the fireplace. In Illustration 1 we have a sofa placed on the far wall directly opposite the fireplace, which is the room’s focal point. The arrows in this drawing and all the other drawings for this post show you how the room’s traffic pattern goes. Upholstered chairs are grouped around the sofa and fireplace. Additional seating (in the form of dining room side chairs, which have seats and backs, but no arms) are placed in front of the windows at both the front and back of the room. They can easily be moved around as needed. Notice that the sofa and chairs on the right counterbalance the fireplace and chairs on the left. The side chairs and chest combinations at the far ends of the room counterbalance each other. Illustration 2 shows two 3 cushion sofas in a room. Two armless side chairs flanking a chest in front of the room are counterbalanced by the 3 cushion sofa in the back. In Illustration 3 notice the upholstered bench. It being just a seat with no arms or back, provides seating to both of the two sofa groupings. Illustration 4 shows two sofas back-to-back with a sofa table between them. This kind of arrangement makes two more intimate spaces in a large room. Illustration 5 is a take off on illustration 4. Four upholstered chairs facing each other, counterbalance the sofa and chair grouping opposite it. Illustration 6 shows two sofas at the far ends of a room. Four chairs are grouped in the middle of the room in front of the fireplace. If the four chairs were on swivels, they could easily be turned toward the sofas, as needed for intimate conversation. Illustration 7 shows a table desk that cuts the long bowling alley look of the room. The chairs by the desk, if they could swivel could face either the sofa or table desk as needed. Illustration 8 has a dining table that seats eight in the room with the sofa. Two chairs that go with the table (dining chairs=DC) are used along with the sofa as supplemental group seating. Illustration 9 has a seating and dining area. The sofa table can be also be used as a buffet or bar area. One of the eight dining chair (DC) was placed with the sofa and upholstered chairs for supplementary seating, and another is placed in the corner of the room. Illustration 10 has a sectional sofa in the space, along with a dining table for eight. One or two of the dining chairs (DC) could be used along side the fireplace for supplementary seating. 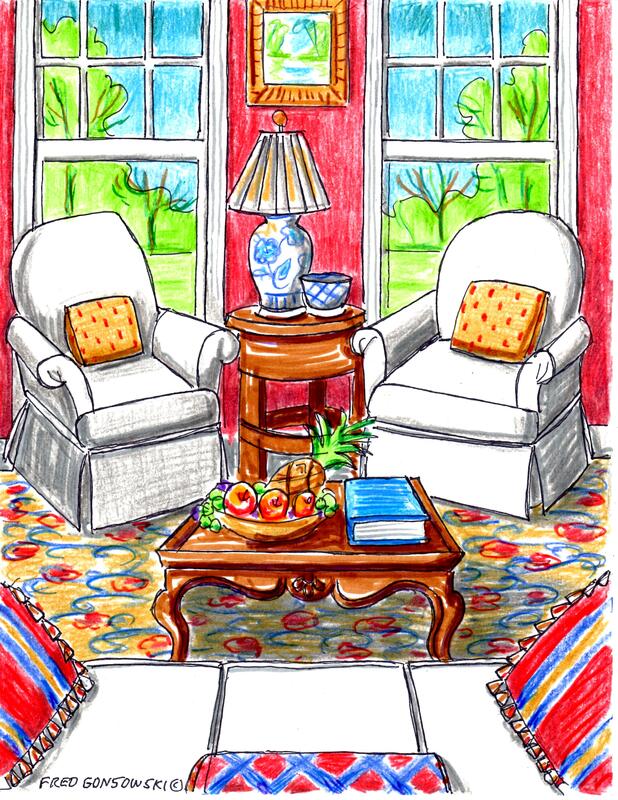 Illustration 11 has side chairs like illustration 1 flanking a half table and chest at the far ends of the room. Illustration 12 shows a large grouping of furniture around a fireplace. Upholstered benches, because they are small (without arms or backs) fit perfectly alongside the fireplace in the small space for extra seating. Shopping for Furniture Before buying any furniture for your home, ask the store what are the measurements of the piece(s) you are interested in for depth, width and height. Knowing those measurements, take pieces of newspapers and tape them together to make templates/patterns to show how big each piece of furniture is. Place them on the floor along with what you already have to see how something that size fits in your space. A piece of furniture that looks regular sized in a cavernous furniture store, might look/be really big in your house. Also get measurements so you can see if the piece(s) of furniture you are interested in can go around a corner, of fit in an elevator if you live in a high-rise. Arranging Furniture in a 15 foot wide by 25 foot long Bedroom 24,2015. Hanging Valances, Curtains and Drapes on Different kinds of Windows 7-15-2012. Piking the Right paint colors to go with the Wood in your Home.. Color Theory 3-9-2013 . I struggle with this in my own LR which has the lovely proportions and high ceilings of an old home but 5 entries. 2 are french doors to the outside,(on the left) so I suppose they can count as windows. It’s a short rectangle with a fireplace facing one upon entering, flanked by one set of windows with high radiators beneath and another set of french doors leading to another room. To the right is a large opening (originally folding fr doors) to the den. The entry of the hall is large and also formerly had fr doors that I hope to restore. I’ve always had a U shape arrangement, but feel that cuts off the room somehow. I’m going to try facing the sofa and love seat with two chairs angled inward by the fplace. Not only do I have to balance furniture within this room, but also with the DR which is very visible and comes off the opposite side of the hall. URRRGH! Hi Teresa, you seem to be my best commenter, and I thank you. I have one comment, when picking the colors for the dining room take the colors from the living room and work them into that space. Look at my articles under Categories Interior decorating principles Pick (Use) four colors when decorating a room 3-7-211, it will help you with working color from one space to another. They saids you didn’t get my first attempt at a reply, so….. Thanks for the personal replies! I can’t believe no one else comments, ’cause your blog rocks. �So many other design blogs just deal with what’s trendy as opposed to the underlying rules that structure things. Often they can do a great diy, but when it comes time to put it all together, it falls apart. �Furniture placement is key, for aesthertics and comfort. A great book is Use What You Have Decorating. My look is somewhat trendy at the moment, but only because everyone else has finally caught up! I have the most ridiculously complex living room situation – long and somehwat narrow, fireplace along one wall and door opening across from it, windows on third side and wide opening to next room on other. anyway, i’m wracking my brains trying to figure out how might be the best way to place the furniture so that both fireplace and tv are focal points (!) and there is not furniture directly in front of the doorway…i’ve been puzzling over this for almost 3 years and have yet to find a solution. might yo be available to help with this?do you do work for hire? Hi there Bustmag Deb. I know design, have helped people in the past, but only in my area. I write this blog to just inspire/get my readers minds going through my essays and drawings. The rest is up to them. Can you mount a flat screen TV on an arm above the fireplace? With all the windows, door, archways etc, it sound like there is not much other space for a TV. I am not really for mounted TVs up above fireplaces, because I think you have to wrench your neck to see them, but sometimes that is all the space you have to work with. Another possible suggestion, could it be mounted on an arm in the corner of a room by one of the windows, and just turned toward the seating area when you are ready to look at it? One time I was on a house tour. The house was an old mansion in the Berkshires of western Massachusetts. They had a small flat screen TV to the left of the fireplace, just hung like a painting, along with other art objects. Could anything like that work for you? It was also mounted on an arm. Is there a home theater/TV store in you area? 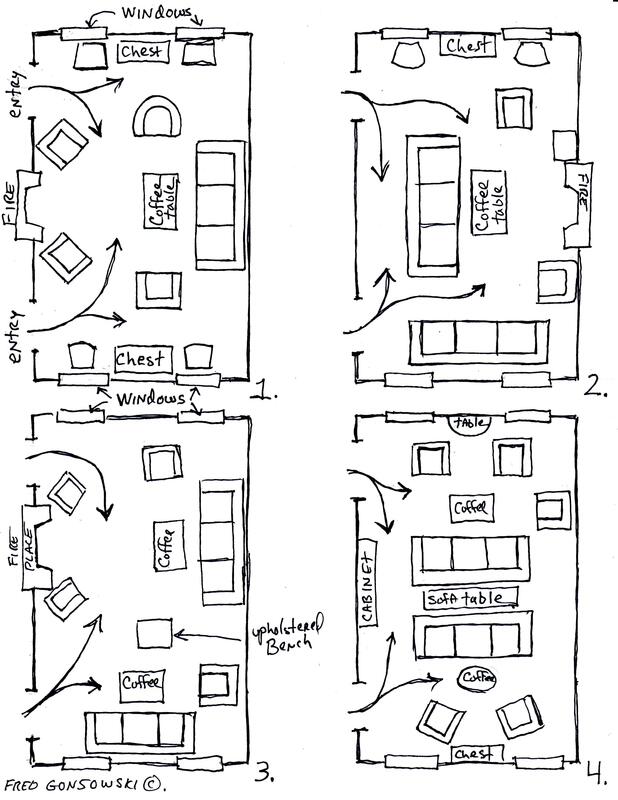 Could you take exact measurements of your living room(showing windows, doors, archways, the fireplace, etc), with drawings of furniture placements, and go to a store like that, and pretend to be looking/thinking about buying a TV and pick their minds? Good Luck with your project. Happy Holidays! Hi Fred! Great info! We are currently building a wall in our basement to subdivide it so there will be a family room. It will look a lot like #12. The fireplace wall is 30′ long, the width is 15′. No windows. Entrance on the two narrow ends and the traffic pattern goes all the way across from one entrance to the other. This is our family room. We regularly seat the six of us to watch a movie on the pull-down screen over the fireplace. I like the arrangement in #12 generally, except there is not much seating facing toward the screen. And we could replace one of the “upholstered benches” with the DVD cabinet. I haven’t bought furniture yet. Any ideas for how to make this work as predominantly a movie viewing room? Thanks so much for being willing to help the rest of us out! Hi Erin, Happy New Year to You and your Family! My first thoughts about your family room in the basement is… Why not put in some fake windows. Could you have/put full sized windows in the cellar, (just like you have on the ground floor of your house) but instead of glass have mirrors in the window panes, AND then hang drapes, blinds, etc over them to give the illusion of windows. OR could you mount plantation shutters on the walls in window moldings to pretend there are windows behind them? That would give you visual architectural interest to the space and make it less underground looking. I think in one of my Companion Posts, that goes along with this article, I said go out and find furniture you like and get the furniture’s measurements. Make templates/patterns to match the depth and width of the furniture and lay the patterns on the floor to see how an arrangement looks. I say do that. Make sofa and chair templates and have fun arranging them in your space. It will cost you nothing. How about facing a sofa toward the fireplace/movie screen and put chairs along side the sofa in a half circle. Also think chase lounges. Put the sofa in the center with two chairs on each side. My blog posts are just to inspire my readers, in the end, you have to do the project yourself, as I am not really there to see the space. I just try to give ideas to get the readers mind going. Good Luck with your project. Thanks for the good ideas! I’m glad you mentioned the faux windows. I had definitely considered it, but wasn’t sure if it would be too cheesy. Apparently not! LOL! I appreciate the input. Happy New Year to you, as well! Thanks again for your blog! It rocks! Oh too bad the pictures did not post. I did resd and look at the information but mine isnt really in a corner per se. It’s an old house and kinda odd. Well Ill give it a go thanks. Hi there Kathleen, I say take some graph paper and mark off the exact measurements of your room on it. One square equals 6 inches. Make sure you also show doorways, windows, the fireplace, etc Them measure your furniture, and draw it out on the graph paper, and then cut then out. After that start placing the different pieces of paper that represent the furniture in different patterns in the room until you get something you think is interesting to you. Read my article, Arranging furniture so sofas talk to chairs. Click here to read it. You might get something from that article. Is there a recommended amount of space to leave for traffic in a room? Also, would have any different recommendations to make for a room with a bay window? Should I just pretend that space isn’t there? Hi there Elaine, I want you to look at my post title Arranging Living Room furniture, so Sofas talk to Chairs, Like the Pros do. My living room is illustration 3A. Look for the chair that is directly opposite the ottoman, next to the love seat. I have 21 inches of space between that chair and a side board (not shown in the drawing) that is in my living room, for people to pass by. Guests are only having to pass by one chair, not many in a row or a large sofa. I’ve had 60 people over for a party, and had no problems with traffic moving around. I think 21 inches is the very minimum number of inches, 24 inches probably would be even better. As for your bay window, I think, first of all people will not be walking into it often. You really only need to have enough space to be able to easily walk into it yourself, and open and close the window treatments, or to be able to step into it and look out onto your lawn or street. Don’t put too much thought about traffic patterns in your bay window. That window is all about You, and your family, not the comforts of your guests. Hope I was of help, thanks for commenting. Every comment, if I can answer it, helps other readers solve their decorating or gardening problems. I am finding so many issues arranging our living room, we have a sideboard, long couch, love seat, and recliner along with a coffee table that our tv sits on and an end table, we have a long somewhat narrow living room, in one corner is our entry way and on that same wall (a long one) is a set of windows together, I feel awful putting a couch in front of them since they start about a foot off of the ground, on the wall attached to that we have a set of french doors that lead to the side porch, attached to that we have another long wall but an off center double archway leading to the dining room and attached to that we have the second short wall that has an archway to the hallway in the corner. I am just at a loss. It was built in 1946 so we’re trying to keep the era in mind but right now it’s just thrown together and in no way cozy or inviting. we also have two kids under two who play around. Hi there Wally’s Mommy, You only gave me a description of three walls in your living room, if I read it correctly. I tried drawing out what I think?? ?it might look like. Put the long sofa in front of the window, no matter what. Can you float the love seat in the room out in front of the French doors?? If so do that. As long as you have space to get to the doors that is all that matters. Put the end table in the space between the sofa and love seat. Put the Sideboard on the wall opposite the french doors, if you can (that is the 4th wall you did not describe). Float the recliner out in the room, kind of between the wall to the dining room and the hall. Can the coffee table be put in front of the sofa, and the TV on some kind of stand next to the Arch way to the dining room? All of my suggestions are just guesses, not seeing the room. Good luck with your project. Terrific ideas…the visual SO helps! How about working in the hand-me-down baby grand piano?? Long narrow living room with windows on long sides fireplace at far end and entry area at close end and with adjacent dining room.?? Hi there Kim, Interior decorating is all about Equal Balance is one of my posts I want you to read. A Baby Grand piano is really not at all different from a dining room table or a desk, as seen in illustrations 7, 8, 9, or 10. If you have the weight of the piano on one side of the room, you have to make up an equal amount of weight on the other side of the room with sofa and chairs, etc. Also think about how you point the piano. If you have the keyboard closest to you the piano will look wider, versus having the front of the piano facing you, and the keyboard the farthest away from the seating area. Also think about height. When the piano is open it will be so many inches tall. You will need something (or somethings combined) on the other side of the room that is/are the same height as the piano when the top is opened for matched height balance. Also look at this post It’s Easy to Decorate a Room with Tall/High Ceilings. Take a piece of paper and try drawing out the shapes of sofa, chairs and piano, as I did for this post. They are simple shapes anyone can draw. Don’t worry if you have a problem drawing them out, or coming out with ideas at first. Even I try a number of options and then see what looks best for me to present to you. Good Luck with your project. Dear Fred, I have a very difficult room that I use as a den/office. There is also an upright piano (that I need to place in this room due to lack of space in my 1500 sq foot house). The room is 10′ x 19′. There are 5.5 ft door openings centered on both long (19′) walls, a 5 ft opening (from the kitchen) centered on a short wall. The opposite small wall that does not have an opening has a large corner fireplace. I had an interior decorator look at the room and he made himself “unavailable after the visit. My ceiling in this room is 8′. I would be willing to pay you for a floor plan. Hi there Susan, since you did not tell me which corner of the room has the fireplace on it, I’m guessing and making it on the left. OK, not really seeing the room but drawing it on piece of paper, here we go. On the right 19 foot wall, between the kitchen and the right entry to the room I want you to place the upright piano. Directly opposite it on the other 19 foot wall I want you to put the desk (home office). The piano and desk are counterbalancing each other on the 19 foot walls, at that side of the room. Hang up a picture over the desk, so the combined height of the desk with picture is equal to the height of the piano) Read this post…Interior Decorating is all about equal balance. Now thinking about your room, it really is nothing more than a wide hallway. On the other side of the room (fireplace side), after trying to block it off on a piece of paper (I made a grid, kind of like a piece of graph paper), I marked off 10 feet and tried to put a 7 foot sofa on that side of the room, it did not work, it is too long. Would you be interested in putting two armless sections of a modular sofa in the corner of the room opposite the fireplace??? They would be a mini couch, and the two individual sections would most likely measure out to just shy of 60 inches, and put a chair or two with the modular pieces. Don’t buy a love seat Read this. Another option would be to try 3 or possibly 4 comfortable chairs (depending on size of chairs) around the fireplace with a lamp and end table between two of them, and a floor lamp tucked in the corner or someplace on that side of the room for extra lighting. When buying an end table for that room, get one with a glass top and don’t buy anything bulky as you don’t want anything that is too big looking in that small space. Another thing that you could do is put a 6 foot by 9 foot area rug (oriental, or other pattern) in the seating area by the fireplace so you kind of designate the area (it could be laid on top of wall-to-wall carpeting if you have it) Also put a 4×6 foot companion carpet to the big carpet between the piano and desk it will give some warmth to that side of the room. As always, not seeing the space, my comments are just guesses, Good Luck with your project. I really enjoyed the 12 layouts that you provided. I am still having difficulty with my family room. Maybe I am just not bold enough to think outside the box! Lol.The room is roughly 20ft by 12 1/2 feet. One 20ft wall has french doors that lead out to the pool. The french doors has windows on either side (appox length is 11ft). There are two entry points similar to your examples. They are opposite the wall with french doors. I have my TV on the 12 1/2 inch wall and it really is not an option to move it. The TV is near the entry point from the main foyer and the other entry point leads to kitchen. Any suggestions? I could absolutely CRY because I was at my wit’s end trying to figure out how to decorate a room we had added to our home (10 x 30′) until I found this post. Now, if I just had you as my bestie to go shopping! 🙂 Thank you so much for this awesome post!!!! Hi there MJ, I love your enthusiasm, did you look at this post Arranging furniture in a 12 x 24 foot long room, your room being 10×30 falls into the same size range. Good luck with your project, glad my posts are so inspiring for you. I just found your blog via pinterest! I am eager to read your posts! This one caught my eye because I have a 70’s walk out ranch with one rectangular living room upstairs and it has stumped me from the beginning! It is very similar to your sketch except my openings are a little more offset and one is wider (but both on the same wall) and the opposite wall has a large window and the other two walls are windowless. I was considering creating a built in on one of the short walls as a “focal point” but might have to do a little more furniture arranging before I get to that point! Love these suggestions!!! I love your ideas! I love the 12 different looks for the same room – long living room. I have a similar living room situation that I’m struggling with. Do you do consulting work? If so, please email me! Hi there Melanie, yes I do interior decorating consulting work, but only in the Albany area of upstate New York. One I put the couch in the center of the room, Facing the wall where my TV is, but there was so much wasted space behind the couch. I just don’t know what to do, and I’m not happy with my apartment because I can’t get it looking nice. I have very few items ( a couch, Chair, Coffee table, end tables, tv stand and TV) in my living room. do you have any suggestions on how i could arrange it or what pieces of furniture i should add. If it works, i added a link to floor plans, ect that I made up of my living room, I don’t have a tape measure, only a ruler so they aren’t exact. Thank you for taking the time to read this! Hi there Carissa. I looked at your floor plan and think you should put your sofa on the 18.8 foot wall, with one end of it kind of by the window on the right. Don’t think about centering it, if you can’t between the windows. Next float the chair you have out in the room next to the sofa and face it toward the TV. I don’t know what kind of fabric or pattern your sofa is upholstered in, but I want you to go out and buy a 4’x6 or 5’x7′ area rug and put it in-front of your sofa to define the seating ares (even if you already have carpeting on the floor). Take newspapers and tape them together to see which size looks best and works for you, then go out and buy that area rug. Also bring a cushion, or arm protector from the sofa with you when shopping for the rug and put it up next to any rug that attracts you to see if it works with the color and pattern on the sofa. Next go out and buy an armless and exposed legged chair ( pick a color from the area rug and do it in that). A chair with just an upholstered seat and back will not look too bulky in a small room. But before buying the chair, get its measurements, and bring those measurements home and tape newspapers together to make those dimensions of the chair and place that template on the floor, by the TV and heating thing to see if it works for size in your place. Next go out and buy a chest to put on the wall opposite the TV. You will have extra storage with it. The TV will be counterbalancing the chest which will be at the other far end of the room. Buy a large mirror and hang it vertically over the chest to suggest height in the room. Read my article about decorating a room with a tall ceiling. Even if you don’t have one, it will tell you about stacking things for vertical tension you will be able to read it here. If your sofa is a solid, get some pillows that pull colors from the area rug. Accessories make all the difference when decorating a room. Finally go out and buy one or more floor lamps and put them in the corners of the room, if and wherever you need extra light. Don’t buy anything too over the top, just something that is a classic style. Good luck with your project. Hi My name is Freda and have living room space and trying change around. Please help… ok I have a nice size sofa that is back is face the window and I have a matching chase with pillows already with them. I love the color it just trying to change them around , I have in the room, ok also have a tall cabinet, two end tables, a sofa table , a room divider, a floor lamps. Also my entryway is when you come up the stairs you are in the living and my dinning area is there too, it is together. I would love to get help with arranging furniture in my great room which is 15 x 24. 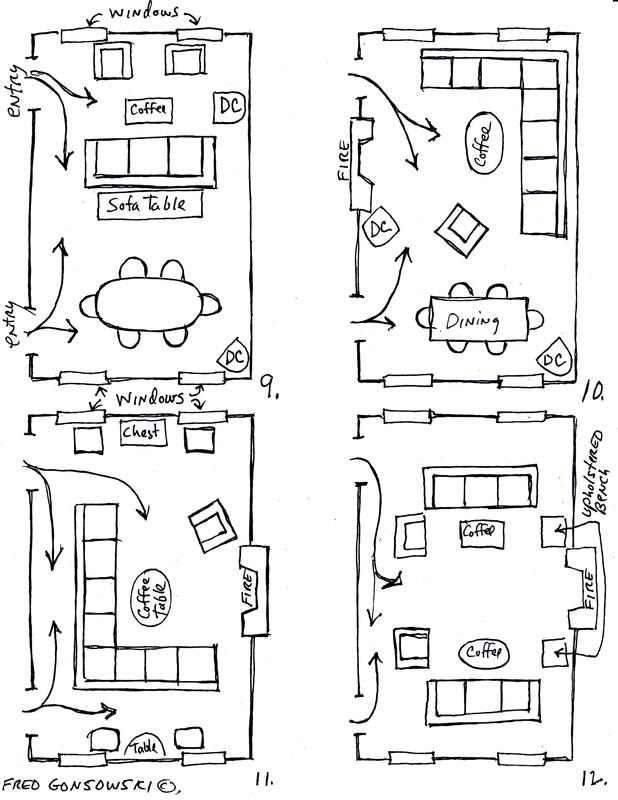 Using your illustration 2 and assuming the wall at the top is north, I will describe my room. The north wall, which is 15 ft wide, contains the two windows plus a door between the two windows. The east wall has a 5 ft fireplace basically in the middle if you exclude a door at the very southeast corner leading to a short hallway. The south wall extends 9 feet from the east door and then there is a 6 ft opening to the entry. The west wall, starting from the southwest contains an opening to a tiny hall leading to the kitchen, 8 1/2 feet of wall space, a 6 ft wide opening to the dining room and then another 7 feet of wall space to the north wall. I have lived here many years but have not been truly satisfied with the furniture arrangement in this room and am ready to buy new furniture. The design must accommodate a 55 in screen TV. I would be most appreciative of any help you are willing to provide. Hi there Jerry, soo sorry to have taken forever to get to your question. If my drawing of your great room is correct, this is what I would suggest. Hi Fred, I need your expertise! I’m trying to decorate the wall above the sofa. I already have a painting above the love seat but since the long sofa is off-center due to the love seat how would I decorate? I can’t arrange them differently since this was the only arrangement I could do. I have three square mirrors (they are about the same length as the long sofa and 25 inches in height) I want to put above the sofa but I don’t know if I should center them over the sofa or wall. I’m assuming if they’re not centered with the sofa it will look strange but then if I do put those mirrors above the sofa I’ll have about 4 feet of wall space left on the left side. I’m going to have a 4ft tall plant in the corner but there will still be a space left between the plant and the mirrors. I also have 2 sconces I wanted to put up on the wall but I’m at a loss as to how to decorate. Please check out a link I included so you can see the pictures of the living room and sconces. I would greatly appreciate if you could give me some advice… Thank you very much for your help!!! (1)Hang the sconces one on each side of the flower painting. (2)Hang two of the three mirrors over the sofa centering the mirrors over the centers of the cushions of the sofa. Make sure the bottom edge of the two mirrors lines up with the bottom edge of the flower painting to their left. (3) Hand the third mirror on the wall to the right of the sofa, at the same height as the two mirrors that will be hung over the sofa. The bottom edges of the painting and mirrors will all line up with each other as they go across the walls. If you question how this will look, trace the mirrors on paper and tape them up on the wall as I am suggesting and you will see how I think it should look. Good Luck with your project. any tips for a room with 2 focal points? We have large great room with a corner fireplace and a large entertainment center. I’m clueless on how to arrange the furniture. Hi there Heidi even though the size is not yours, read my post Arranging Furniture in a 12 foot wide by 24 foot long Living Room some of the illustrations show multiple groupings. Also look at the Companion Posts that I put with that article, there might be something there that might be of help. Your problem might be a topic that I will cover in an upcoming post. Thanks for your inquiry. this is fabulous but what if the room looks just like this but it is a bedroom? Thanks Fred. This is the dilemma I sleep in every night. I have high arch ceilings with wooden beams (lengthwise). My rectangular room is 15 ft wide by 25 ft long. I have a fireplace right in the middle on one side of a 15 ft wall. On the opposite side 15ft wall, I have placed my California King Bed. On one side of the 25 ft wall–leads to my outdoor balcony (so it includes french doors and several windows on the same side). The other side (or 25ft wall contains the entry to the room (about 7ft in) and the rest is just wall on each side completing the 25 ft in length. Anyway, the bed and night stands on each side of it, look good but I can’t figure out what to do with the rest of the space. I have different types of furniture all over the house that I can incorporate in the bedroom such as chairs, love seats, desks, lamps, mirrors, art, etc but can’t figure out what placement should be and if I should accent a wall as anchor (the wall with bed or wall with fireplace–or do they compete or should they be two or three different spaces here). Anyway, any advice you can offer is greatly appreciated. I have scoured the internet for similar room designs and didn’t find anything close to my situation. Most are more square or just narrow and long. Thanks so much. This is awesome Fred! Actually, your timing is perfect because I’m in the midst of redoing the floors so I can relocate or add furniture in the right combinations as soon as it’s ready. I really appreciate this article and can’t wait to dive in and have a new well-planned room! Hi there Cheryl, I really felt bad that I was not able to get to your problem at the time, but sometimes things have a right moment, and today seemed to be it. Again, THANKS for your comment! Thank you for sharing these ideas! Any suggestions for a long living room (with dinning room table at one end of room) with just couches? We have 1 couch and 3 loveseats. Not as ideal as having chairs, however it’s what we’ve been given and for right now we are grateful to have what we do! Just not sure the best way to arrange it! We have a fireplace, and a tv in a different spot, but along same inside wall. Outside wall is all windows. Long end opposite dinning room area has stairs. Thanks for your advice! I am wondering; what the dimensions are of the room for which you sketched 12 furniture arrangements? My room is about 12 feet wide and I’m not sure if these placements would work. Thank you so much. Hi there Joy, the room was kind of imaginary, I would say in the 14 foot x 26/28 foot size. 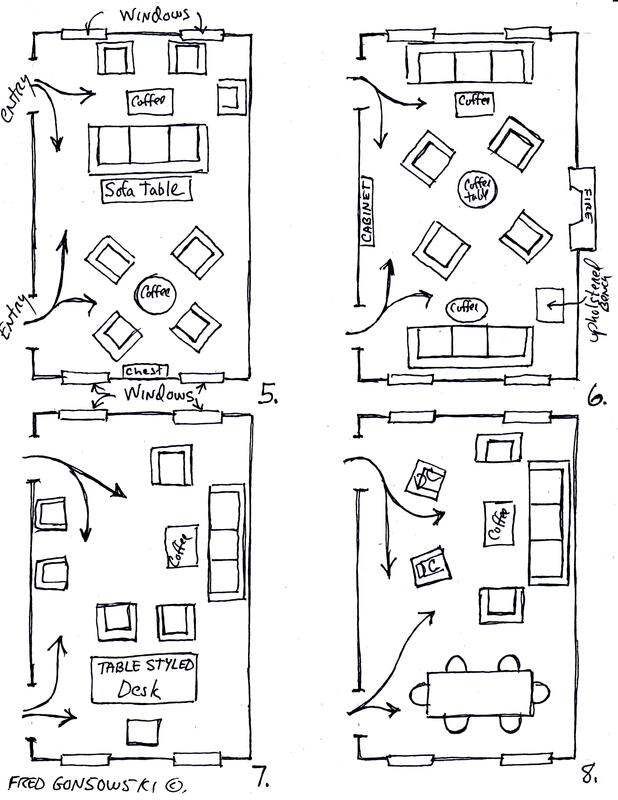 Have you looked at my blog post titled Arranging furniture in a 12 wide by 24 foot long room. That room was figured out to scale so it might be better for you. Hi there Nasser, being from America, I only know dimensions in feet, not meters. Could you come up with the conversions. be interested in hearing. Either way, great website and I lopok forward to seeing it develop over time. Hi there Beginner HTML, I don’t give my e-mail address as I don’t want to be bothered by my readers. If they want they can ask a question here, just as you made your comment.